Onyx offers both Nginx file caching and Redis database caching as standard. 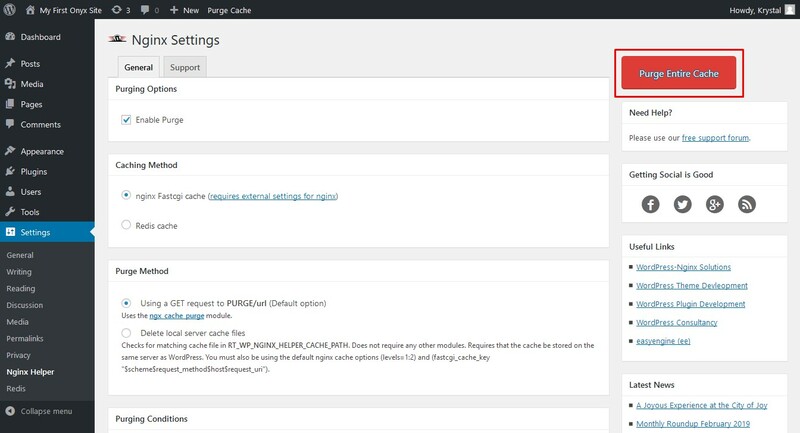 WordPress installations on Onyx come with the Nginx helper and Redis Object Cache plugins pre-installed. If you've migrated your site to Onyx and these plugins are not installed, or they've been removed for some reason we have a guide on reinstalling the default plugins and other Onyx tools. If you've migrated your site to Onyx from elsewhere, please be sure to disable and/or remove any other caching plugins as they may well interfere with your sites performance on the Onyx platform. 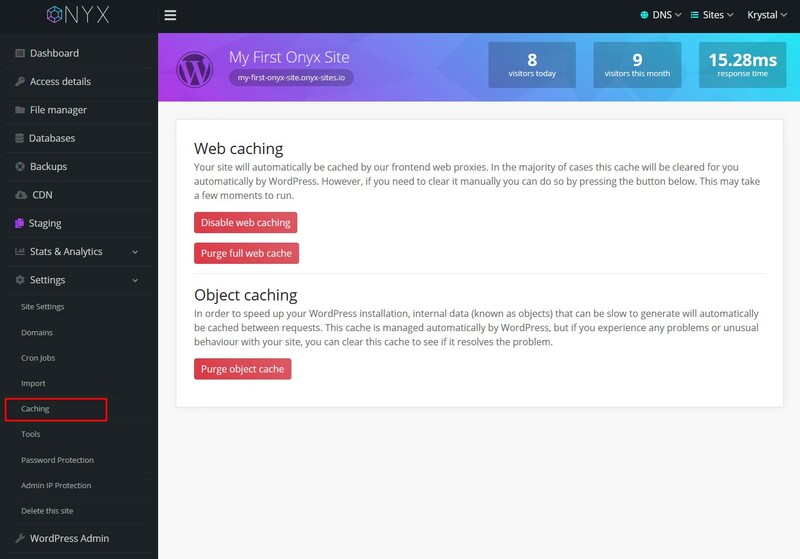 The cache features of Onyx can be managed from either the Onyx Dashboard, or from within your Wordpress site. Some options are only available from the Onyx dashboard and some only from WordPress, these are noted in the following instructions. You'll need to start by logging in to your Onyx dashboard. From your Onyx dashboard, click the Manage button for the site you'd like to access. If you make changes whilst the cache is disabled and then re-enable it, please be to sure to 'Purge the full web cache' to ensure you're changes are shown correctly. 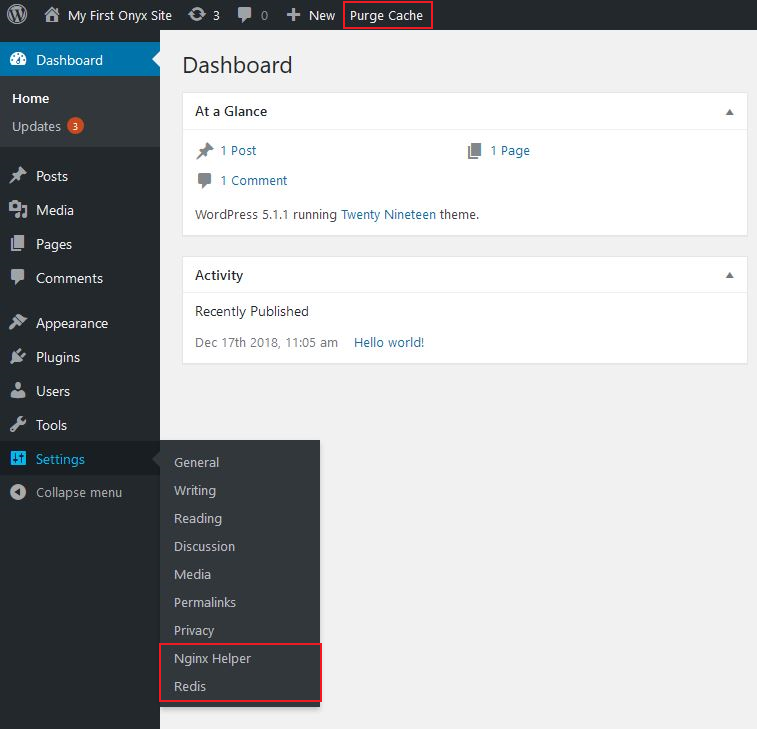 You'll need to start from within your WordPress dashboard, either logging in to the site directly, or by logging in to Onyx (step 1 above) and then clicking the 'WordPress Admin' button from the bottom of the left hand menu. The cache controls within Wordpress are split in to three locations.